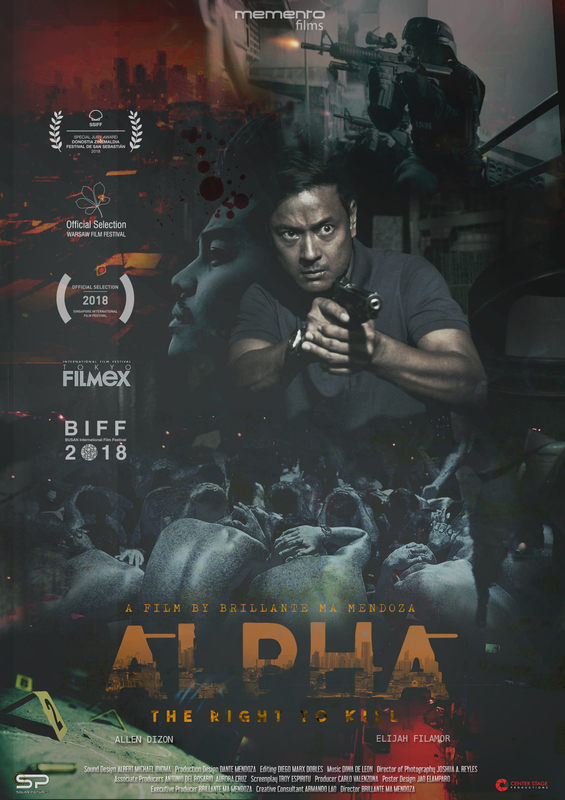 Directed by Brillante Mendoza, “Alpha: The Right to Kill” hits Philippine theaters on January 16, 2019. On the same day, “Ang Probinsiyano” star Coco Martin took to Instagram to promote the film. Set against the backdrop of the Philippine government’s crackdown on illegal drugs, “Alpha: The Right to Kill” was written by Troy Espiritu. The creative consultant was Armando Lao, who wrote and directed “Biyaheng Lupa” in 2009. Currently playing Cardo Dalisay in “Ang Probinsiyano,” Martin starred in several films directed by Mendoza. Among these are “Masahista” (The Masseur), “Kaleldo,” “Tirador,” “Serbis” and “Kinatay,” which made Mendoza the first and still the only Filipino filmmaker to win Best Director at the Cannes Film Festival. Martin starred in “Biyaheng Lupa” with Alan Paule, Mercedes Cabral, Eugene Domingo, Angel Aquino, Julio Diaz and Jaclyn Jose. In 2016, Jose became the first ever Southeast Asian actor to win Best Actress at the Cannes Film Festival through her titular role in “Ma’ Rosa,” which was directed by Mendoza and written by Espiritu. Paule plays a cop in “Alpha: The Right to Kill.” The main characters are played by Allen Dizon and Elijah Filamor while Baron Geisler plays one of the major supporting characters. Most of the cops in “Alpha: The Right to Kill” are real-life police officers. Dizon enjoyed playing his role in the film because unlike his typical good guy characters on the small screen and on the big screen, he plays a bad cop in Mendoza’s most recent film. In 2017, Dizon, Filamor and Geisler starred in the Netflix series “Amo,” which was also directed by Mendoza and written by Espiritu. Also featured both in “Amo” and “Alpha: The Right to Kill” are Jalyn Taboneknek Perez, Apollo Abraham, JC Tan, Nikko Delos Santos, Dexter Macaraeg and Dante Wayan. “Alpha: The Right to Kill” is screened all over Luzon, Visayas and Mindanao. Among the screening venues are Cloverleaf, Fairview Terraces, Gateway Cineplex, Glorietta 4, Greenhills, Market Market Cinema, Sta. Lucia and Trinoma. Gaisano will screen “Alpha: The Right to Kill” in Davao, General Santos City and Tagum. It will be screened in Robinsons’ branches in Bacolod, Butuan, Ceby, Ortigas, General Trias, Iligan, Iloilo, Jaro, Laoag, Manila, Metro East, Naga, Pavia, Pampanga, Tacloban, Tagum, Tuguegarao and Valencia and in Starmall’s branches in Alabang and San Jose Del Monte. SM Supermalls will screen Mendoza’s most recent film in Bacoor, Cabanatuan, Cauayan, CDO Downtown Premiere, Cebu, Clark, Dasmarinas, Davao, East Ortigas, Fairview, Iloilo, Lanang, Legaspi, Mall of Asia, Manila, Marikina, Megamall, North, Pampanga, Seaside City Cebu, South Mall, Sta. Mesa and Telabastagan. It will also be shown in Vista Cinemas in General Trias, Bataan, Evia, Iloilo, Pampanga and Sta. Rosa. ‘Riverdale’ Season 3 episode 9 spoilers: Archie, Veronica broke up?